Photos courtesy of the respective designers. My first apartment was an intimate 14’x 22’ studio with a detached kitchen and bathroom. When I moved all those years ago, the walls were the standard white you’d expect in a typical rental. Six years later when it came time to move on, those same walls were again white, but beneath that fresh layer of paint were five different adventures in transforming a basic room into a vision of comfort, convenience and style. Were five redesigns in six years excessive? Probably. Did I spend way too much time in IKEA looking for furniture and meandering in Home Depot ogling over color chips? Arguably. But was it incredibly fun turning my modest accommodations into a completely new space? Absolutely. Now, 10 years later, I have a home with many rooms at my design disposal. Do I put a new splash of color or mix-up my motifs every 12 months like the old days? Not of late. Do I dream about a seasonal shake-up when paging through my home décor magazines? Of course, all the time! In this spirit of diversification, we wondered what it would be like to take a single room or type of room and give it a makeover three times over. To help us with this experiment, we invited not one but two local designers, Laura Neuman of PepperJack Interiors and Jane Reed of Decorating Den and Brush Strokes Inc., to each take on three designs, each presenting their own set of expectations and challenges. Laura Neuman has duality built into her DNA. Growing up in Colorado and spending time in New Mexico and Wyoming, she surrounded herself with a love of history and art from an early age. Her “practical” side earned her a degree in industrial engineering at Stanford and a nearly 20-year career at Hewlett-Packard. And while she enjoyed the exposure to cultures and sensibilities that her job offered her through frequent travel, she couldn’t help be envious of the fun her colleagues were having in the marketing department. This longing for creativity and “a hands-on life” provoked the engineer to consider her skills, experience and passions, and ultimately compelled her to shift gears and enter the field of interior design. While Neuman prefers a clean, classic and traditional approach to design, she believes “life is too short to be ordinary” and encourages her clients to push the envelope a bit while staying true to their core principles and style. “Traditional is flexible and timeless, plus it makes sense financially over time,” she says. For our project, Neuman chose a nearly empty dining/living room as her starting point, with creamy white walls, a beautiful concrete floor and an immovable black baby grand piano. As inspiration for her three vignettes, she imagined three different women ­- Diana, Kate and Emeline - and created individual looks that reflect each of their personalities and lifestyles. For Neuman, all three women are “interesting, intellectually curious and sensible,” and deserving of their own unique living space. Emeline makes her home in the American West while carefully carrying over her European heritage. A few pieces carry over from Diana and Kate’s rooms, like the pine table, rug, pottery and table lamp, showing how simple it can be to incorporate old pieces into a fresh design with a totally unique character. Beautiful French armchairs and a large impressionist landscape are brought in, as are large tools and the addition of flowers and greenery to bring a little of the outdoors in. Collect images and pictures that reflect the desired feeling and style, maybe even create a collage of these. Interview several interior designers to get a sense of how they work and who might be a good fit with you and your project. Focus energy and budget on one room at a time rather than on pieces and parts all across the home. Spend budgets wisely and choose good investments in design. Stay clear of short-term trends that are likely to pass in the next few years. 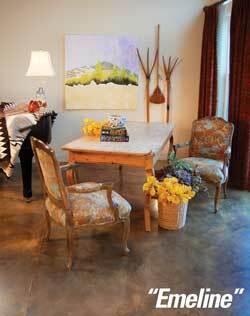 Carefully select and place appropriately sized accessories that make a space sing. 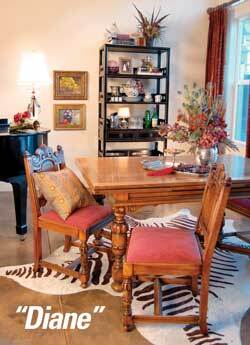 For more on Laura Neuman and PepperJack Interiors, call 916-834-9751 or visit pepperjack interiors.com. Coming to a new country, let alone starting a new company, can be a very daunting experience. Luckily she found Decorating Den, giving her access to hundreds of suppliers. Additionally, her husband is a general contractor specializing in remodeling, allowing the couple to provide a comprehensive service to their clients. Reed says her current design mood is nostalgic, combining retro looks from Victorian to modern and adding her own favorite splashes of bright colors, textures and patterns. For this challenge, she took on three similarly-sized guestrooms and transformed each based on the homeowners’ needs, paying special attention to inherent shortcomings in the space. Converting the bedroom of a recently off-to-college daughter into a guestroom that also doubles as her school-break respite was not an easy task. Yet, Reed found a way to honor the students “bubbly” personality while turning a very small room with limited closet space into a functional guestroom. “We painted the room in three horizontal stripes in different colors separating them with a bold two-inch band,” says Reed. “We continued the color into the ceiling to create more height to the room.” Bold black furniture, like a leather sleigh bed, was added for drama against the three youthful shades of green on the walls, and the new nightstand and chest brought additional storage. Sleek, contemporary bedding, tufted silk window dressings, porcelain wall discs and a fun zebra-print rug and chaise lounge give the room a dose of energy and style. This awkwardly spaced room came to Reed with a large leather bed already purchased by the client and little architectural detail throughout. The goal: to create a warm and relaxing space for weekend guests to enjoy. She began the task by adding crown molding to the ceiling and painting both the ceiling and walls in different shades of taupe for contrast. A large mirror at one end of the room instantly made the room appear twice its size. A duvet with a small geometric pattern and black and taupe fabrics accenting the sides make the bed look smaller and blend into the leather side rails. Using the same fabric as the duvet, inverted pleat panels were used on the window with the rod ceiling mounted in order to complete a smooth line. Reed’s penchant for color is seen in red accents scattered throughout the room. A favorite piece of furniture or art can be the starting point for décor. Whatever the style, a room with a comfortable chair or chaise lounge will be greatly appreciated. For guestrooms, include a luggage rack or chair specifically to hold an open suitcase or duffle bag. Keep the room uncluttered and make sure there is plenty of storage. Good design is available to all and should be fun and stress free. 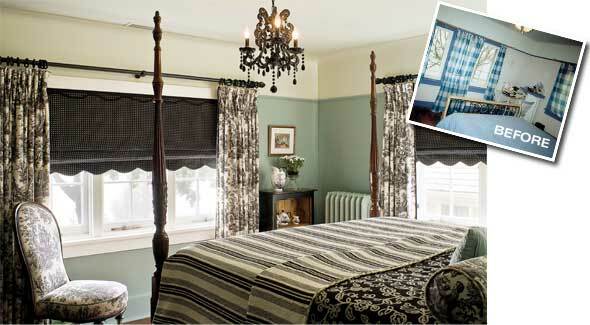 For more on Jane Reed and Decorating Den, call 916-294-9777 or visit decdens.com/janer. 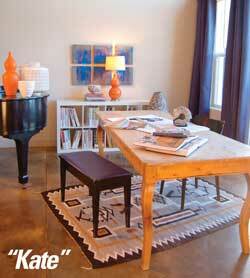 Susan Huddleston is the owner and creative force behind Susan St. James Interior Design. She started her design business in 1991 after completing her degree, and has loved interior design ever since. With a passion to help homeowners find comfort and tranquility in their surroundings, she helps her clients discover the secrets of the interior design trade with ease. Decorating a home is a forum for creativity that is open to everyone. What makes a house a "home" is what each person uniquely brings to his or her space. There are no rules in decorating, but there are rules of thumb. These 10 tips cover the basics from start to finish with key elements necessary for a successful…and hopefully stress free and fun decorating project. Dream, explore, discover! Take some time to look through magazines, Web sites, newspapers and randomly clip things that catch your attention. Don't over think it too much. This will help you find an inspiration picture and ideas you may want to incorporate. Know your space. Whether reading a floor plan or drawing your own floor plan, understand your room. How does it feel? How do you want it to feel? What will you do in this room? You can have beauty & function in every room. Develop a plan. Look at your home as a whole and then break down each area. Whether doing a single room or an entire house – this is important. Set a budget & priorities. Inventory the items you want, that you will keep, and create a wish list of what you would like to put in each room. Get organized. Keeping everything together at your fingertips is the best way. This way, while you are out shopping you will have access to your paint chips, fabrics and inspiration photos. It will help keep everything together while you are working on your project. Pick a starting point. Whether using an inspiration picture, a piece of art, furniture that you love or a fabulous fabric, start with that and go from there. Additionally, when working on an individual room, start on what will be the focal point or area of the room and spread out from there. Don't be afraid. Especially of Color. Everyone makes mistakes, (even the professionals). You will never know unless you try. Paint is really a great way (and inexpensive) to add personality to your rooms. A great tip is to remember the 60-30-10 rule: 60% of a dominant color, 30% of a secondary color and 10% of an accent color! Translated to a room, it typically means 60% of a room's color is the walls, 30% of the room's color is the upholstery and 10% is an accent piece or floral arrangement. Furniture. Arranging furniture can be overwhelming and back-breaking! With a floor plan and some "rules of thumb,” it can be easy and virtually mistake free. Creating interesting seating arrangements and an element of surprise with furniture placement will keep your room feeling unique. Don't forget about the ceiling! We all know we need to think about the floors and walls, but often forgotten is the ceiling. 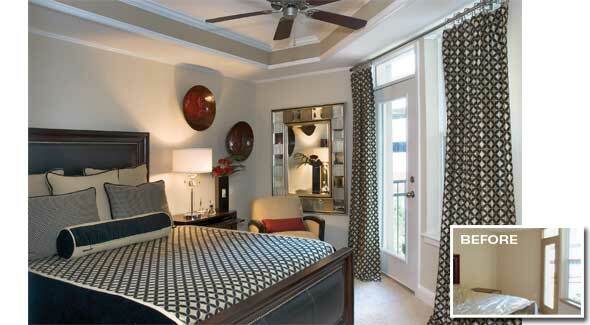 Ceilings can be a great way to add special touches and character to a room. 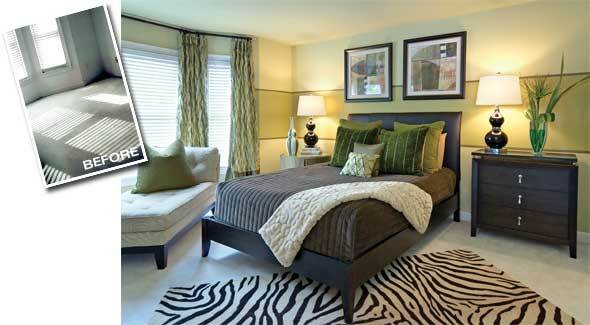 A slightly lighter color than your walls will make your room feel and look finished. Lighting. A key element of every space that is often forgotten. There is day-to-day lighting, task lighting, and accent lighting, which are all equally important to a room that is both functional and beautiful. Lighting can make or break a room. Accessorize, accessorize, accessorize.Often forgotten or eliminated because of budgets, but most important. Accessories define the personality of your room. Plant ledges, mantels, and tabletops are key places to create interest and define the personality of your room; 15-25% of your budget should go towards accessories…and this is not the place to negotiate.